I always count myself very lucky to have my own family, which has always inspired me to do well in any aspects of my life. From my parents side they were always there for me. With good education, good upbringing and lots of encouragements to maintain healthy good eating habits, they put always an extra effort for us. From the childhood, we have been advised to eat right and healthy balanced food and showed importance of it, I remember there has been conversation about eating wholegrain, fruits and vegetables and to get a nutritious and balanced diet, and that too haven't changed till todays date, my mum is not with us anymore but dad hasn't forgotten his duty to keep those habits alive in my kitchen and consecutively reminds me to use fresh and healthy ingredients. It always amazes me that, in that era there wasn't any information sources around, yet our parents and grandparents knew about healthy diets and kept holding those values of eating habits without going too much in detail and making a fuss about it. In my family there is a great example - My Grandmother ( Nan ) who is 95+ living in India and leading good life, her secret of to stay healthy eat everything but moderately and keep walking. My great grand father lived till he was 106 , every morning at 4am, he ate sesame oil Halwa, and kept walking 6-7 miles everyday ! I saw similar situation when I got married and came to live with my in laws. They share same principals and same values on eating healthy and balanced diet, so for me it was very easy to adjust in this routine to carry on. Me and my family follow the same meticulously in our diet too, every day I cook fresh from scratch, include whole grains,colourful vegetables and fruits. I do not mind for an extra effort in making our meal healthy as much as possible. I always make an effort not to use refined and processed items. Me and family, we enjoy vast amount of healthy food, our kids eats almost all the vegetables fruits , good fats and dishes which are made of whole grains, nuts and seeds. Either it is Savoury Mixed Wholegrain Porridge, Protein packed Granola, Millet flour Chapatti or Beetroot, carrot, radish salad with seeds and many more. You can check out here for more delicious yet very healthy recipes. 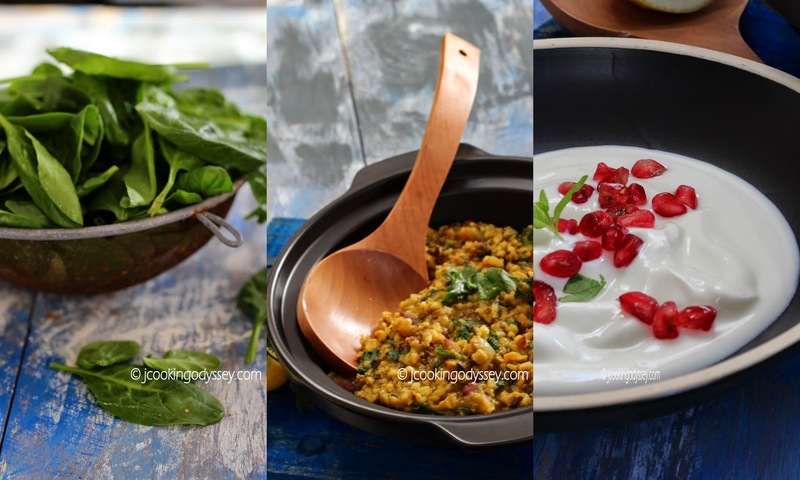 I prepare healthy dishes according to seasons, in warmer days salads, healthy smoothies take places in our kitchen and in winter always comfort food like soups, various type of daals and khichdi are welcomed. Place one cup khichdi mix in a heavy based pan and dry roast for 5-6 minutes or you get slight toasting aroma . Place soaked khichdi mix in a pressure cooker and add 1 1/2 cup water and salt, turmeric and cook till 3 whistle goes off. Heat oil in a kadai, add cumin seeds and hing. When cumin splutters add raw peanuts and roast on a very low heat. Now add crushed ginger chilli , onion and sauté onion for a while. Add garlic chutney, salt , red chilli powder, sambhar masala powder . Fry for a few seconds and add just couple of tablespoon water, so masala wont get burn. Now add chopped spinach and broccoli and sauté for couple of minutes. Add lemon juice and cooked khichdi and mix well. Cook for a couple of minutes and serve hot. wow that's a super healthy khichdi. Love the photos too.